The Cylinder Boxes are a Montessori Sensorial material that helps the young child learn to grade objects according to size. Toddler 2 students worked on the yellow Cylinder Box, which requires them to first sort the cylinders from largest to smallest and then carefully stack them into a tower. This activity requires thoughtful use of the visual sense, as well as good fine motor coordination to build the tower successfully. The Toddler 2 students continued to enjoy our weekly group snack with fresh food provided by their supportive classroom parents! The children recently enjoyed exploring red, yellow and orange bell peppers: They had the opportunity to look inside the pepper, feel the seeds, smell the scent and of course taste the sweet and delicious fruit. A new piece of work in the Toddler 2 classroom is cutting paper strips with small scissors. This challenging work requires eye-hand coordination, hand strength and coordination of several fine motor skills. It often interests and absorb Toddlers for long periods of time and can be easily adapted for the home environment. With a pair of child-appropriate scissors, a bowl and a supply of thin pieces of construction paper, many children will happily spend fifteen minutes or more carefully cutting the paper strips to pieces. They find great satisfaction in this work, and the resulting pieces are later used to make collages and other art projects. 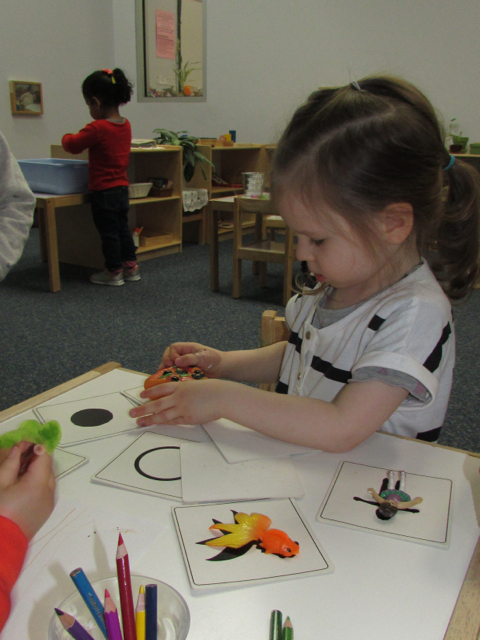 Toddler 2 students are using the new silhouette matching work from their Sensorial area. Having carefully laid out the cards showing the silhouettes of a variety of objects, the children match the corresponding objects to their shapes. This activity encourages visual discrimination and helps the children to understand the relationship between a three-dimensional object and the two-dimensional representation of that object on the card. Toddler 2 children are working on picture stories, a new activity in the Language area of the classroom this week. To use this work, a child chooses an interesting picture from a basket and glues it onto a piece of blank paper. Then, he or she narrates a story about the picture, which the teacher transcribes using the student's exact words. This encourages speech development, builds vocabulary and gives the Toddlers an opportunity to be creative "writers" before they are developmentally able to write themselves.